The former boss of Fiat Chrysler, Sergio Marchionne, has died in the hospital aged 66, following complications from routine surgery. FCA chairman John Elkann said: “Unfortunately, what we feared has come to pass. Sergio Marchionne, man and friend, is gone. “I believe that the best way to honor his memory is to build on the legacy he left us, continuing to develop the human values of responsibility and openness of which he was the most ardent champion. My family and I will be forever grateful for what he has done. Our thoughts are with Manuela, and his sons Alessio and Tyler. 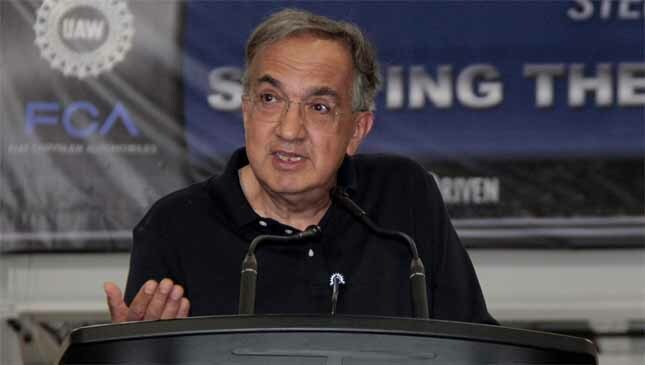 Marchionne was due to retire next spring, but was replaced as FCA boss a few days ago after being admitted to hospital. The new CEO is one of his most trusted deputies, Mike Manley. Frankly it seems hard to take in. Marchionne had shown almost superhuman energy, vibrancy and force of character during the 14 years the car world and we at Top Gear had known him. We send our condolences to his family and those close to him. Manley was born, educated and began his car-industry career in Britain. He’s been a kingpin of recent years at Fiat Chrysler, by running Jeep, the brand that contributes three-quarters of the group’s profit. While overseeing expansion of its model range, Manley has lifted sales by a staggering six times. He’s pushed it into Asia, and into Europe where sales have gone up by huge multiples—though still remain moderate. Under Manley, the Group will doubtless continue the five-year plan outlined by Marchionne only a few weeks ago. There’s a brief summary at the end of this story. Essentially it’s an extension of Marchionne’s philosophy over the years since he took over the running of the Fiat Group when it was in a state of near-paralysis in 2004. Marchionne was always obsessed with cutting costs and investments where he saw no probability of payback. In the process he slashed the ranges of the Fiat and Chrysler brands and was outspoken in his reluctance over hybrids and electrification. These savings, he calculated, would free up money to invest in the potentially profitable premium business and SUVs and pickups. But he also viewed the business not just as an automotive enterprise, but focused through the lens of the stock markets. So he separated the cars business from the huge truck-and-agricultural CNH division, and also part-floated off Ferrari. These brought big gains to the owners of Fiat shares. His great coup was to take over the bankrupt Chrysler-Jeep-Dodge-Ram business and very rapidly pay off its debt to government, shortly after turning a profit. He had always been in favor of industry consolidation, and the cost savings of component and platform sharing. But this deal looked breathtakingly brave because at the time Fiat wasn’t a whole lot less shaky than Chrysler. Marchionne was astoundingly driven in his time in the job, working pretty much non-stop, and expected the same of those around him. He made quick, ruthless decisions. But he always explained himself—no other industry boss was so outspoken, blunt, articulate, and clearly brilliantly intelligent. He was also very funny. For sure he had been unsentimental about the business. He delayed investment in Alfa for nearly a decade until he could see the right way to do it. He recently said “I hated restricting Lancia. I own and drive an Integrale. But we need to be unemotional.” He actually loved cars, you see. At the first showing of the Giulia, he said: “Giving a voice to the real Alfa Romeo was a moral imperative.” He kept his Ferrari Enzo at Alfa’s Balocco track, so he could pelt it around for a few laps and clear his head from the dizzying array of business plates he kept spinning.